i stopped by the broiler the other day. was a bit more lively than on recent visits, yet still pallid compared to last summer. as always, i find more interesting cars hiding in the back for whatever reason. 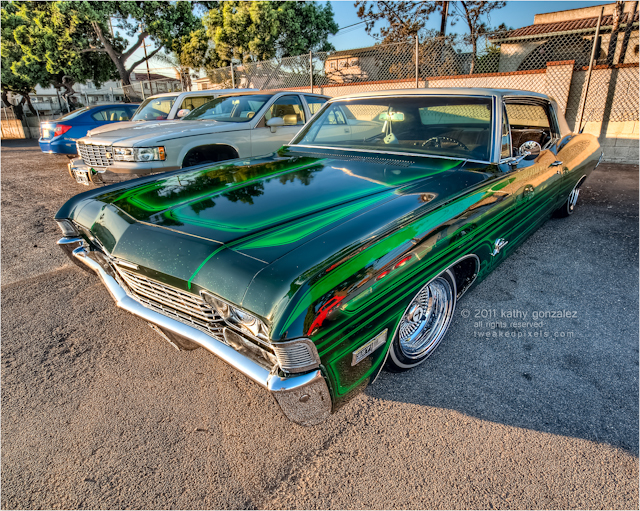 this impala was one of those. on first look, it was an eye catcher, with it's shiny paint, glitter and all. but on closer inspection, there are a few imperfections on the pinstriping/airbrushing, but maybe it was just because i was getting up close and personal with the thing. still, it's a pretty thing just the same.